General Mills and Star Wars joined forces to bring you the Star Wars Far, Far Away Getaway Sweepstakes at GeneralMills.com/StarWars, a promotion where Star Wars fans can win a trip to the Star Wars Celebration in London, England. Plus, two hundred fifty instant win prizes will be awarded during the Promotion Period, including special edition Star Wars posters, Light Sabers, Limited Edition Star Wars Cereal Box Sets, Kylo Masks and Stormtrooper Masks. To promote the Star Wars: The Force Awakens movie, General Mills has created specially-marked packages of Star Wars cereals. Each of these cereal box contains a 13-digit code that is needed to enter the Sweepstakes. During the Promotion Period, buy any specially-marked box of General Mills Star Wars-inspired cereal and look for a code inside the product package. Alternatively, you may obtain a Code without making a purchase by sending an email to FarFarAwayGetawaySweeps@epiinc.com with “Code Request” in the subject line. 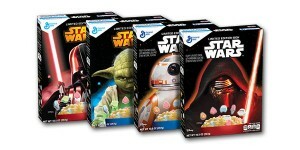 Once you obtained a code, go online to generalmills.com/starwars to enter the code and register for the sweepstakes. You’ll be required to either connect with Facebook or fill out the entry form by providing your first name, last name, email address, and date of birth to receive one entry into the Sweepstakes. Then, you’ll be offered the opportunity to play the Instant Win Game to see if you’re an instant winner. You are allowed to enter the Sweepstakes once per day through May, 23 for a maximum of ninety total sweepstakes entries. You are also allowed to play the Instant Win Game one time per day throughout the Promotion Period. The Promotion commenced at 12:00 a.m. ET on January 1, 2016 and will be ending at 11:59 p.m. ET on December 31, 2016. Codes must be submitted by no later than May 23, 2016 to be eligible for the Grand Prize Drawing. The Star Wars Far, Far Away Getaway Sweepstakes is open only to legal residents of the fifty (50) United States (including District of Columbia) who are at least twenty-one (21) years old at the time of entry.